One of the most unusual ways to view the eclipse is on an airplane. Because the path of totality travels across the breadth of the US, there will be numerous flights that will provide unparalleled views of the eclipse. 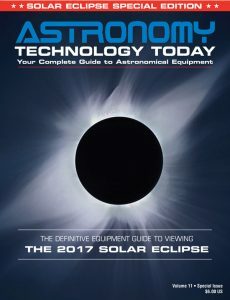 If you are planning travel on that day, you might want to plan a flight through totality! As reported in USA TODAY, several scheduled flights will provide excellent views of the eclipse. Alaska Airlines is going one step further by offering a once in a lifetime “The Great American Eclipse” experience on August 21, with a special charter flight for select astronomy enthusiasts and eclipse chasers to experience totality from 35,000+ feet above the earth. The flight will depart Portland at 7:30 a.m. PDT and fly off the coast of Oregon, allowing guests on board to be among the first of millions to witness this phenomenon. The invitation-only flight is not commercially bookable, but Alaska Airlines is giving one lucky fan and a guest a chance to win a seat on the flight. The contest began on July 21 on Alaska Airlines’ social media channels. The video below is from 2016 when Alaska Airlines adjusted Flight #870 from Anchorage to Honolulu on March 8, 2016 so its passengers could catch a solar eclipse from 35,000 feet.